Avista is the San Francisco Bay Area and Southern California leader in professional grade, do-it-yourself karaoke machine rentals. It’s easy to understand why: our systems have a fantastic selection of songs, from the oldies to the latest chart toppers, across all genres. Our karaoke gear is the right combination of being professional grade, but also easy-to-use. 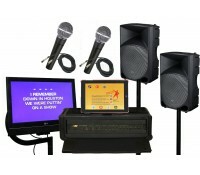 Best of all, our karaoke systems are affordable. Perfect for kids and adults alike, call now to book the antidote to same old stale party. Avista's karaoke songs are updated continuously, and we're bound to have the songs you want to sing, whether it's a Fleetwood Mac oldie, something by Eminem, or the latest from Lorde or Taylor Swift (presently only English language songs are available). 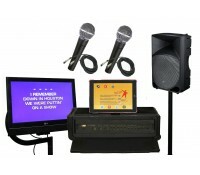 Our systems employee iPads to access the most current songs selections, and our karaoke mixers, microphones and speakers are professional grade. iPad systems require wifi-connection; if one isn't available, inquiry about our cell-based systems. If you are picking up your karaoke machine rental, we take the time to familarize you with every aspect of the system. Forgot something just before your party? No worries, we're available 24/7 to answer questions and get you going again. Our karaoke rental service is available for pickup and return from our San Francisco, San Jose, Pleasant Hill and Los Angeles locations. We also offer full service delivery, setup and breakdown service at an additional charge based on your location. Karaoke Machine Rentals Customers love us on YELP! In the thousands of events we assist with each year, every one is as important as the other. (Sunnyvale, CA) We rented the Karaoke system with mixer, 2 mics, 1 speaker, iPad and display for a weekend backyard party. Came with necessary stands and cables. System set up easily as per instructions that were reviewed during pickup. Worked flawlessly. Everyone enjoyed singing and said system was among the best they have seen. Very professional setup for an amateur activity like Karaoke. (San Diego, CA) We rented a bunch of equipment from Avista to do an outdoor karaoke/movie event for a summer camp. The process for extremely easy and the staff was very helpful in explaining all the equipment we had and how to set it up and run it. Checking in and out were quick and easy and the price was very reasonable for everything we got. It couldn't have been easier to run the event with how Avista set us up. I will return to Avista for all my future needs. (Walnut Creek, CA) Easy to pickup and drop off equipment. High quality home karaoke equipment. Good service and good song lists. I'd use them again. (Washington D.C.) Great service. Very helpful intro to/explanation of the equipment on pickup, policies were clearly explained, prices were reasonable, and staff were friendly. Thank you, Avista!